On October 12, 2016 the Union Bargaining Team, AT&T Local Presidents and Local Mobilizers met with CWA District 9 Vice President, Tom Runnion at the District 9 Headquarters in Sacramento. Vice President Runnion and Bargaining Chair Ellen West met with AT&T’s Executive Vice President of Labor Relations, Mark Royse, and Vice President of Labor, Melba Muscarolas. The outcome of that meeting, and bargaining status, was shared with the group. After the last two weeks of discussions with AT&T it is apparent that the company is not moving and insists that District 9 members accept what the other regions across the nation have agreed to in their negotiations. 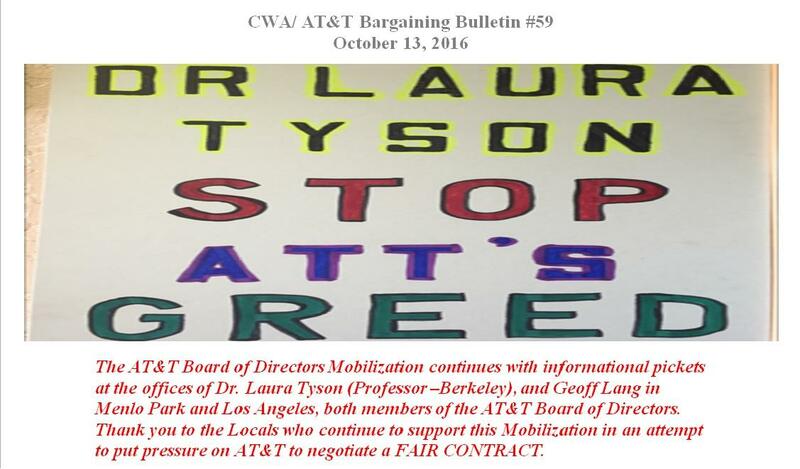 The Union has repeatedly told AT&T that District 9 members will not accept the same retrogressive terms! Continue to Demand a FAIR CONTRACT! AT&T boasts profits of$42,000,000,000.00 in just the first quarter of 2016. WE DEMAND OUR FAIR SHARE!